An Acquired Taste of Japan – Inago and Hachinoko! Natto is an acquired taste. Fermented fish, fungi and vegetables are acquired tastes. But eating insects? Now that is a truly unique experience for much of the world! Japan shares a heritage with other Asian countries where certain insects are eaten as a nutritious food source. 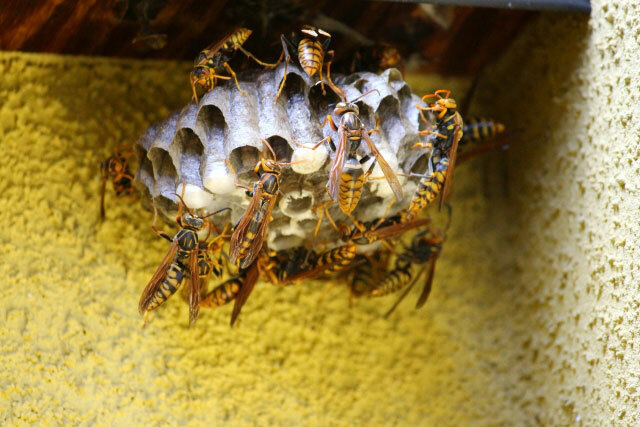 There are a few common types of insects eaten in Japan including inago (rice grasshoppers) and hachinoko (wasp or bee larvae). 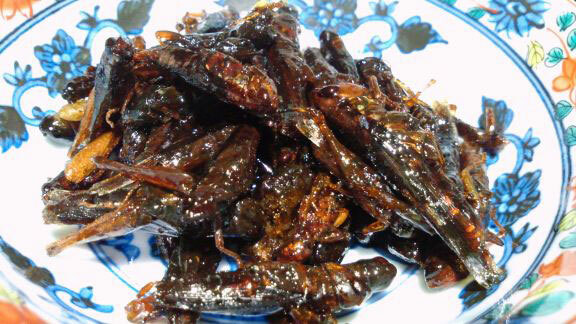 Eating these insects has a long tradition, especially in Gifu and Nagano Prefectures which are located in the mountainous regions where fish were not abundant, and livestock was limited. These particular edibles are known to provide beneficial fat, protein and B vitamins. 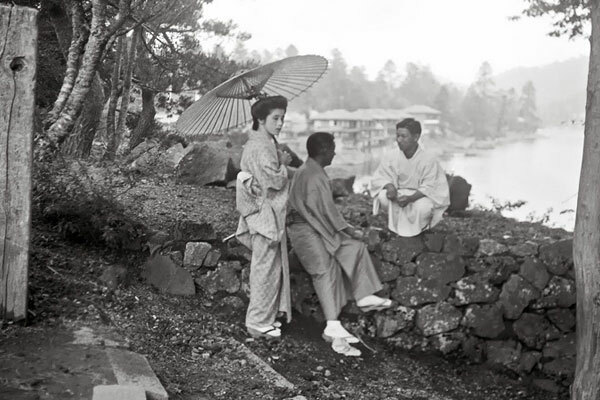 In lean times, inago and hachinoko supplemented many people’s diets, especially during their harvest in the cold months of winter and after the devastation of World War II. 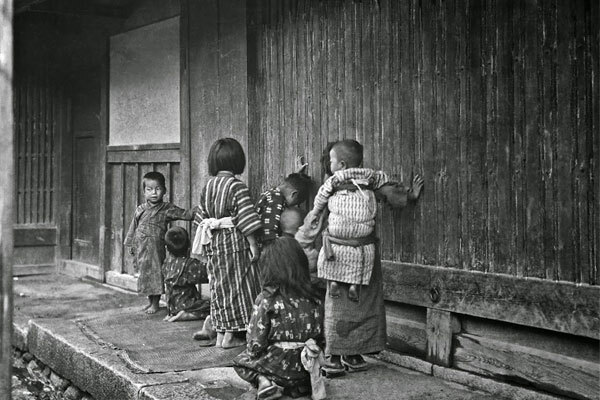 Following the mid-1900’s, when industrial pest control became more prevalent and when high-quality food was substantially available to the general population, the tradition of consuming inago and hachinoko lost favor. Today, consuming both of these insects is enjoying a resurgence, as they are readily available in packaged form and as artisanal chefs are looking at them as a sustainable and delicious food source. 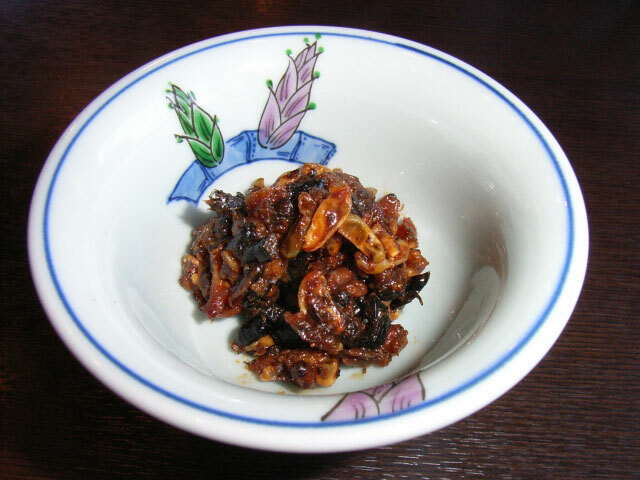 Inago prepared as tsukudani, a traditional way of cooking with soy sauce, sugar, and sake, make crunchy snacks. 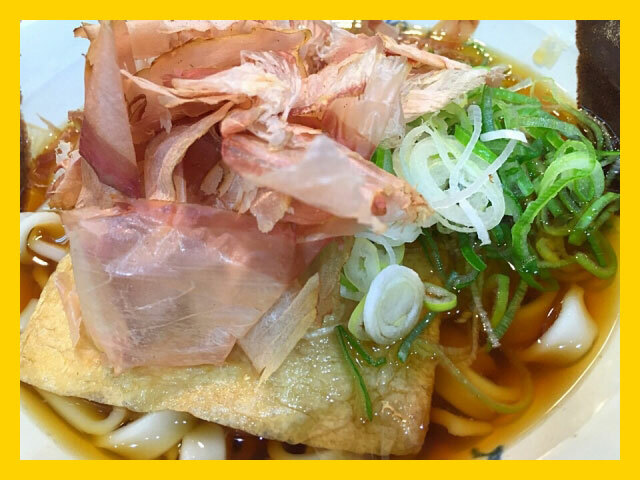 They are often enjoyed with beer, sake or tea and as side dishes accompanying more traditional main dishes. Connoisseurs find inago have a mild, nutty flavor. Similarly prepared as tsukudani, hachinoko are softer and can be served with rice in dishes called hachinoko gohan and hebo gohemochi. Both inago and hachinoko can be found online, at retailers, and sometimes even in vending machines in Japan. But the best place to eat them are at matsuri, or festivals, specifically celebrating these cultural traditions. In November, the Kushihara Hebo Matsuri held in Ena, Gifu Prefecture, hosts a competition among beekeepers as to who can cultivate and harvest the most hachinoko. The competitors show off their harvesting skills and ultimately, sell the fresh larvae to festival-goers. Plus, street food vendors make the best hachinoko dishes! The Tokyo Bug Eating Club is the place to sample inago, and they have events throughout the season where one can catch, cook and consume the grasshoppers. No matter where you get them, we’d love to hear your story about the first time you sampled inago or hachinoko. Be sure to share it with us. And happy crunching! Our large 1-liter capacity Stainless Bottle (SJ-JS10) is here, just in time for spring! This new bottle is lightweight, compact and strapless, maximizing capacity while minimizing the space it takes up your bag. The twist-off lid functions as a standalone cup and lets you drink hot or cold liquids like you would in a teacup or mug, and conveniently allows you to let your beverage cool or warm to the temperature of your preference. The inner surface of the bottle utilizes an innovative double nonstick coating to enhance durability and provides greater protection of the stainless steel against salt-containing beverages like sports drinks. 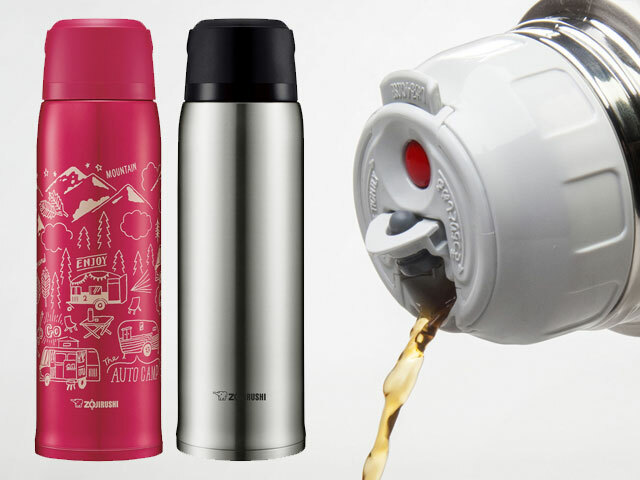 Along with these unique features, this Stainless Bottle is made with high-quality, durable 18/8 stainless steel, and utilizes Zojirushi’s superior vacuum insulation technology. The air between the outer and inner layers of the stainless steel is removed so the heat is blocked from transferring through it, greatly minimizing the temperature change of your beverage. This bottle is smart under the lid, too! It features an advanced stopper with a spout that is opened by a one-touch button, making pouring simple and mess-free. And pressing the close tab seals the spout. The extra-wide mouth accommodates full-sized ice cubes, which makes filling the bottle easy. The stopper and spout, as well as the other areas that come into contact with your beverage, are BPA-free. And as with all Zojirushi products, this bottle can easily be washed with warm water and mild dish detergent. 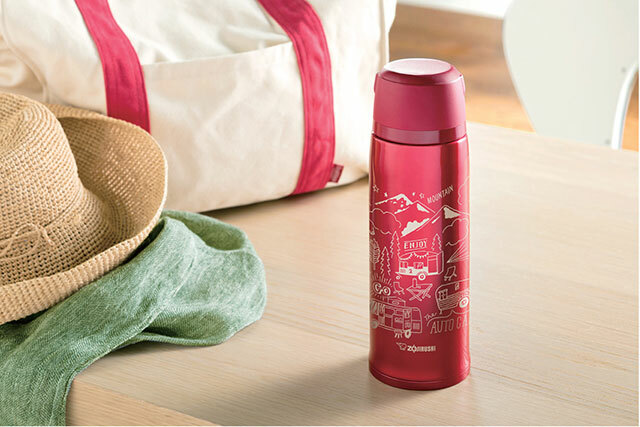 The Stainless Bottle (SJ-JS10) comes in two finishes, a classic Stainless and a bold Red with a fun camping print. So, with a 1-liter bottle such as this, which favorite drinks would you carry around? We have so many to choose from! We always love a perfectly brewed cup of Hot Green Sencha Tea and classic British Tea. For a cold treat, we love this Shaka Plantation Tea which blends black tea and pineapple. And you can’t go wrong with Simply Iced Coffee! No matter what you drink–water or tea or coffee–we know you’ll love carrying this stylish, versatile bottle wherever you go! 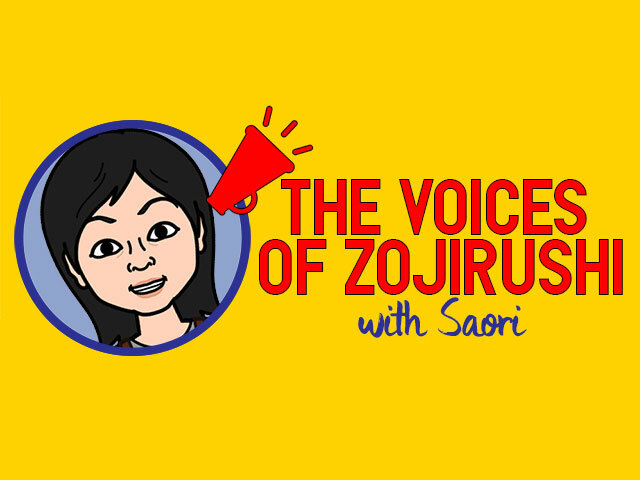 The Voices of Zojirushi – Saori! We caught up with Saori to talk about her creative inspirations and how they’ve influenced her as part of the Zojirushi team. Tell us a bit about yourself. What types of foods do you love to eat? I was born and raised in Nagoya, Japan. My favorite food from Nagoya is kishimen, which is a broad and flat noodle in a broth loaded with katsuobushi (bonito flakes), and ankake supa, which is thick spaghetti sautéed and topped with a thick, spicy, blended tomato sauce and other toppings like sausage, hard-boiled eggs, and bell peppers. How did your love of food, especially Japanese food, lead you to Zojirushi? Well, the ability to use my experience and love of cooking as my job was the first thing that drew me to the company, but the longer I stay, the more I realize that I enjoy the core qualities of this organization, patience and generosity, just like the elephant on our logo. Our corporate philosophy is Creating a Quality of Life. How does your position or your job function create a better quality of life for our customers? 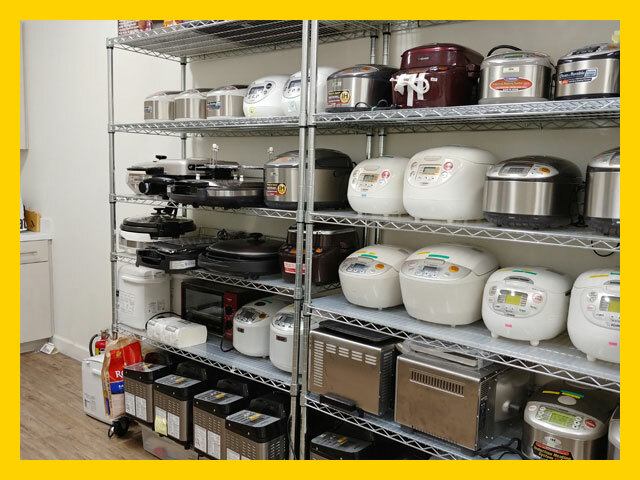 I help develop and test recipes that use ingredients that can be easily found in local markets, with kitchen tools available in any home, using Zojirushi products. Through these recipes, I hope our customers can find not only the joy of cooking, but also the joy of creativity, while thinking about their own ways to personalize recipes to their preference. Creativity, quality and true to its values… that’s what I feel we offer here. If it weren’t for these qualities, my job as a recipe tester would not be necessary. When we develop recipes, we need to thoroughly test, and that often means every model! Much of our product design focuses on safety, usability, practicality, quality, craftsmanship and stylishness. Do you have a favorite Zojirushi product that you believe embodies these qualities? The Home Bakery Virtuoso® Breadmaker BB-PAC20, because while it makes bread-making easy for anybody, it also allows me to be creative and make my own, unique recipes. Some of my favorites are the Cheese ‘n’ Onion Bread and the Fava Bean Risotto. It was something else! And if you could dream up your own next-generation Zojirushi product, what would it be? My first choice would be an ice cream and soft serve maker. A unit that would fit in the freezer and mixes the ingredients to make ice cream and soft serve. My second choice is an indoor smoker. I would like to try making smoked salmon, smoked chicken or ham at home! Saori’s ideas sound delicious to us, and we can’t wait to find out what new recipe she comes up with. Be sure to subscribe to Zojirushi 101, so you get the latest recipes from Saori, and stay tuned as we meet more of the Zojirushi team next month. Zojirushi celebrates their 100th Birthday this year. Congratulations! Believe me, this is no small feat. Even though Japan is known for having many companies that are centuries old, if you compare U.S. companies that started in 1994, one in every four were already out of business by 2004—according to the Bureau of Labor Statistics. I got to thinking—what was Japan like in 1918, when a manufacturer of hand blown glass liners started the beginnings of the company that would one day become Zojirushi? 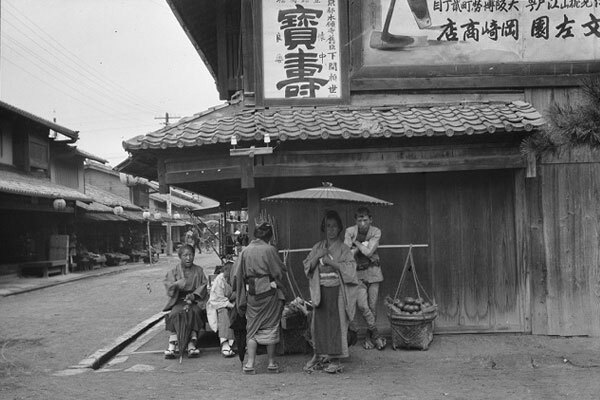 Check out these remarkable images by German-American photographer Arnold Genthe, who followed his passion for Japanese ukiyoe art and spent 6 months touring and shooting ordinary life in Kyoto, Shikoku and Hokkaido during the early 1900s. 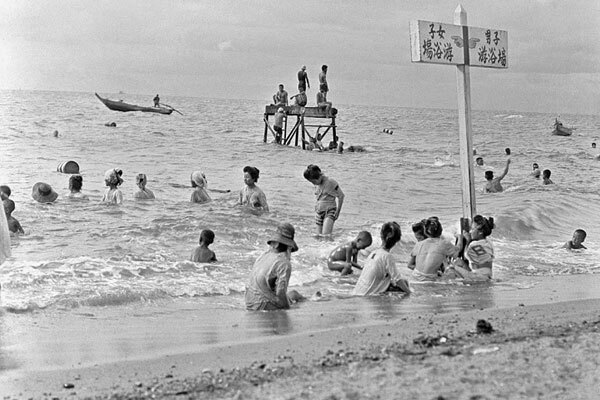 All of these images are preserved and stored today at the U.S. Library of Congress. Look at them carefully, and you’ll travel back into a different world—but was it so different? 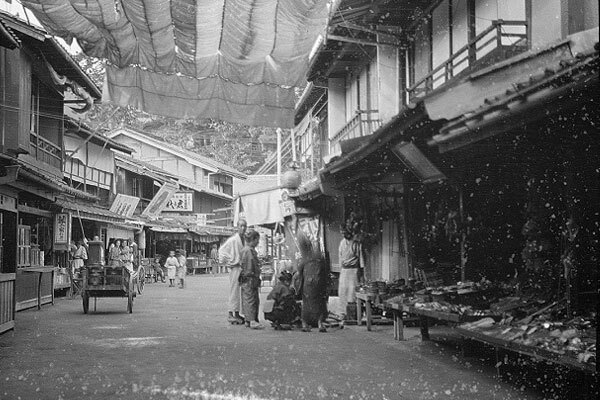 Many of Genthe’s images show street merchants and shopping areas. Not that much has changed, has it? Today’s “shoten-gai” is pretty much the same, other than the buildings and the presence of rickshaws and pull carts. 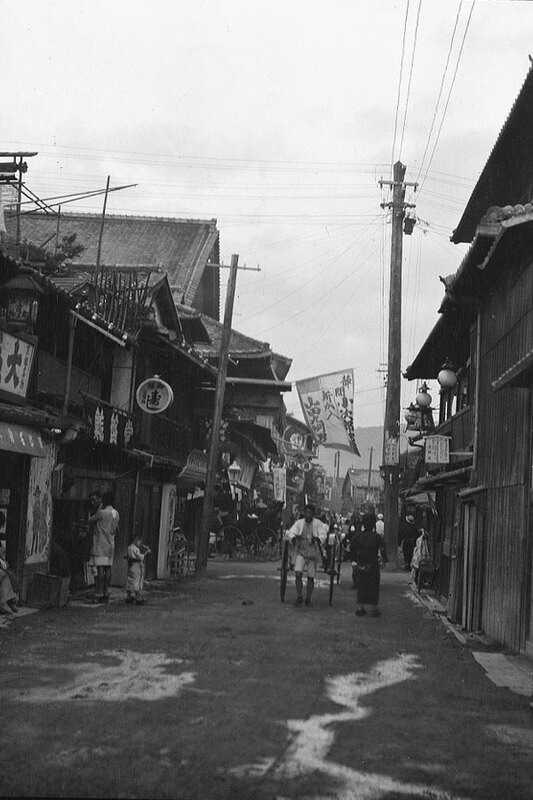 This street even had an overhead canopy–a lot like the ones you see today. See the power lines? 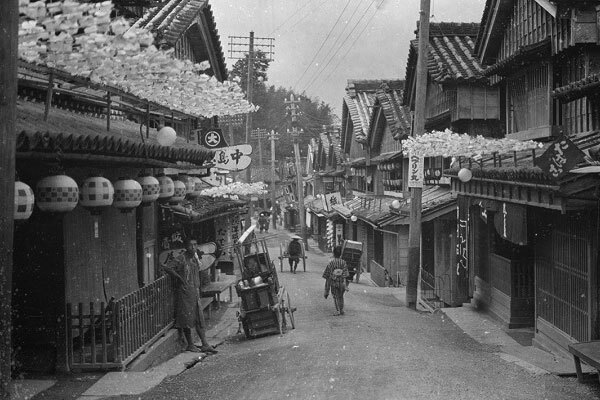 Electricity was first used in Japan in Tokyo in 1878, which wasn’t that far off from the rest of the civilized world. It was still unfamiliar and uncommon in those days. 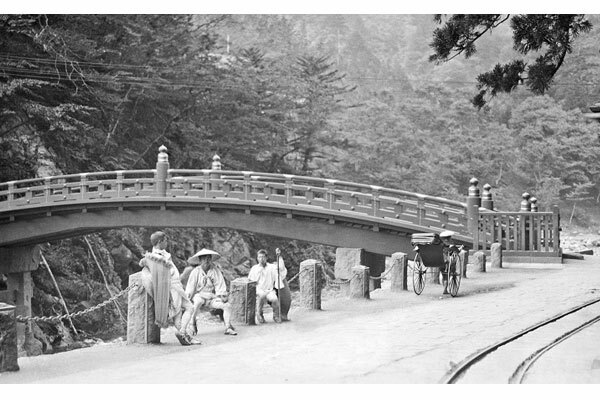 By the time the early 20th Century came, Japan was already an active member of the international community and very modernized. People began wearing western style clothing and started eating new foods, while cars, trains and electricity became part of everyday life. Omigosh! This street definitely needs to be leveled off! A lovely shot of homes nestled into the mountains. 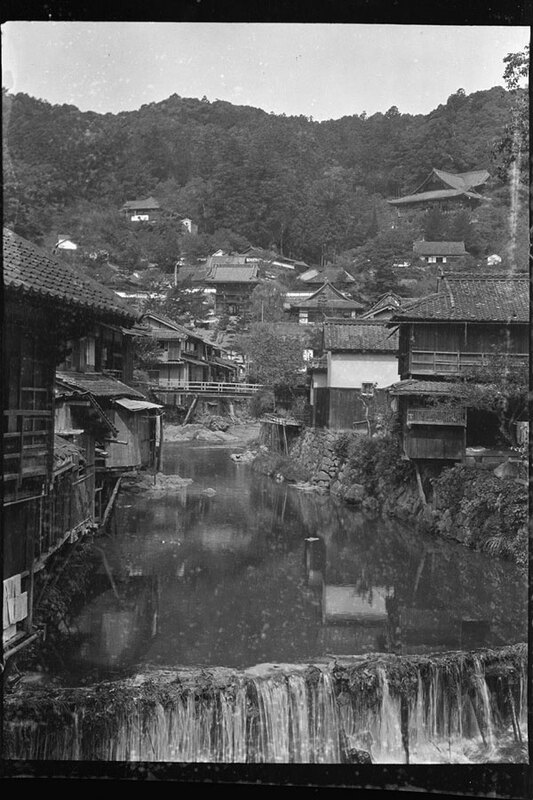 What struck me about this image is that many homes like this can still be seen if you visit the Japanese countryside. Thankfully, not everything changes with industrialization. Weary travelers resting at a pitstop, while a rickshaw trots along. The rickshaw was a popular mode of transportation in Japan during the turn of the century, and it was a distinctly Japanese invention. 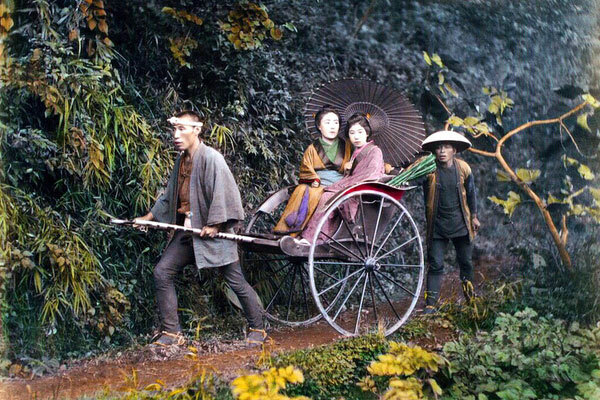 By the late 1800s more than 40,000 rickshaws were carrying people around Tokyo, which was the “taxi” of the times. But it should also be noted that only the wealthy could afford them—a reminder of the widespread class system between the haves and have nots during those days. By the 1930s the rickshaw’s popularity started to decline when Japan’s car industry began to take off. These young people look like they could afford to ride a rickshaw. Enjoying a day at the beach. The sign separates “Women to the left, men to the right”. And look! Emojis! Children are children no matter what. But note that the older girls were made to take care of their baby siblings at a very early age. 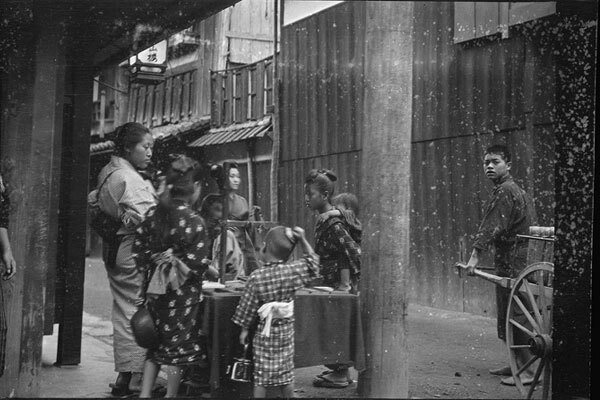 Arnold Genthe took these shots in 1908, keeping his camera hidden while he captured Japanese locals going about their daily lives. It’s a rare look into a past that we don’t often think about—it makes you think about what it means to be 100 years old, doesn’t it?